Yesterday, at Greg Kucera Gallery in Seattle, I ended up face to muzzle with a gigantic horse constructed out of sticks. It was one of many Deborah Butterfield horse sculptures showing this month at her 30th anniversary show. The three horses in the front room have the stature of Clydesdales. Massive and silent, they have the gentle but powerful presence that real horses have. These sculptures are nothing but tangled networks of branches or scrap metal, yet they have an ineffably equine essence about them. Butterfield carefully assembles the salvaged material to evoke sinew, bone, and fat. Sometimes the ears are left out entirely, but the head seems to have its own expression and mood. I sat down in a room full of smaller horses and sketched “Koai’a,” a piece constructed out of sun-bleached koa wood. Here is a photograph of the piece. And here is the drawing. A strange thing happened, once it was recorded in ink. The essence of horse was gone; the sculpture collapsed into an aggregate of artfully placed branches on paper. A stick figure. It made me realize that the sense of the animal was implicit in, and dependent on, the three-dimensional space the sculpture occupies. Even the gaps in the structure gave it a sense of rounded completeness. Each Butterfield horse is a gestural study, where suggestion trumps literal documentation. 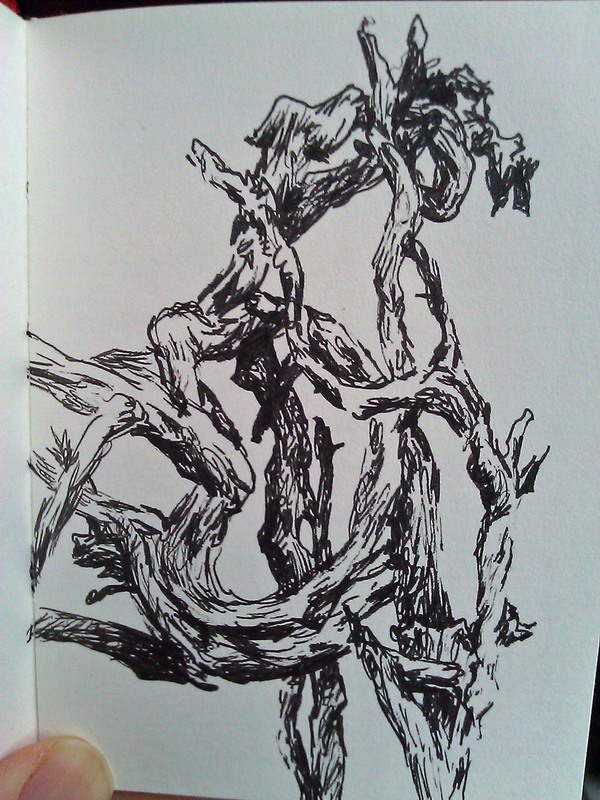 When welded rebar or dead branches with pinecones still attached can imply a sense of a living, breathing animal, you know that’s a great sculpture. 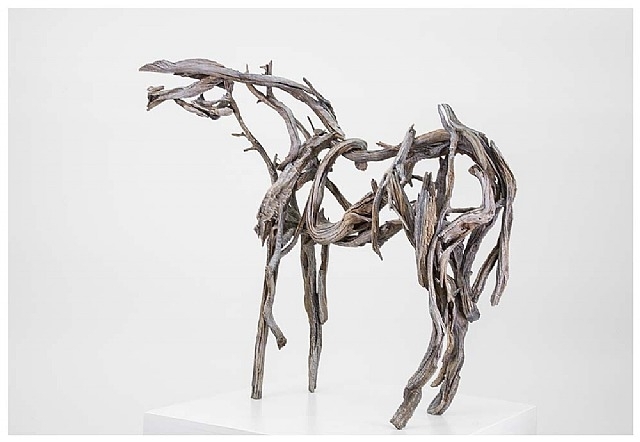 Deborah Butterfield is a master at her craft, and she obviously speaks native horse.